Private gated estate that sits on 13.22 Acres! 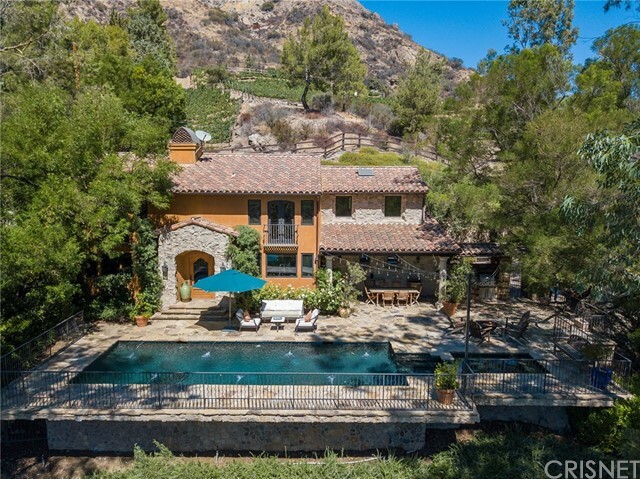 Drive up a long secluded driveway to a grand entrance with a fairy tale-like waterfall, beautiful columns giving a picturesque panoramic view of the Mulholland Valleys. Wonderful indoor/outdoor flow for entertaining friends and family in the incredible outdoor living spaces complete with large covered patio/lounge, outdoor kitchen, and built-in grill. After a hard day, curl up with a good book by the cozy living room or master suite fireplace. Feeling active? take a dip in the infinity pool or challenge your friends to a little one-on-one down on your sports court. The home is perfectly laid out with 4 bedrooms upstairs (including a hang out loft/office) and another large bedroom suite downstairs. Home also features a spacious master suite, formal dining room, Chef?s kitchen with granite counter-tops and stainless steel appliances. Chill out under the shaded outdoor patio while watching TV, cooking at the outdoor kitchen, and enjoying the panoramic view. Big 3 car garage with an office space/room in between garage and bar area. Conveniently located 5 minutes to the 101 or 15 minutes to the beach! Award winning schools in the area, and close to lots of family trail paths for hikes.